Today's postcard had been tucked away inside a copy of "Midcentury Journal", a non-fiction 1952 book by William L. Shirer. LOCATED in the heart of downtown Buffalo convenient to railway terminals, steamer landings and Niagara Falls routes. Operated in connection with Hotels Statler, Boston, Cleveland, Detroit, St. Louis, Washington, New York and Los Angeles. The original Hotel Statler, at Swan and Washington Streets in Buffalo, was opened in 1907. Although Statler continued to operate it, it was renamed Hotel Buffalo in 1923 upon completion of the new Hotel Statler at Niagara Square. It was sold in the 1930s by the Statler Hotels Company. It closed in 1967 and was finally demolished in 1968. The site remained vacant until Dunn Tire Park was built there in 1988. ... [Then, the Statler Towers were constructed in 1923.] 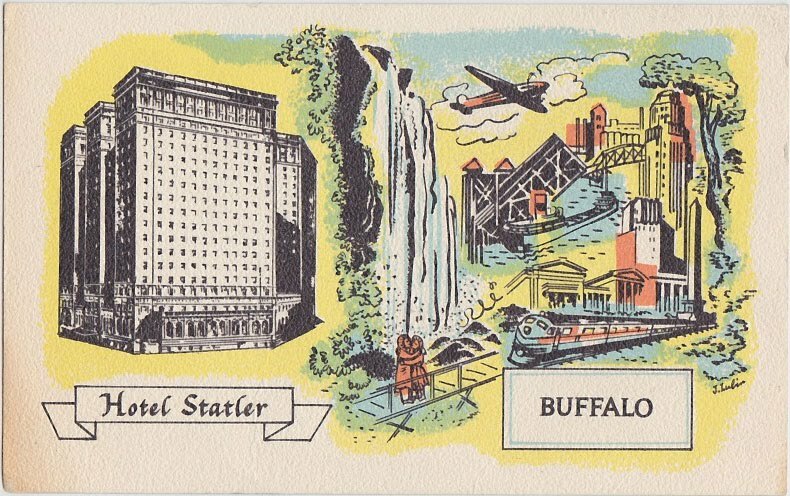 The second Buffalo Statler was gradually converted to offices starting in 1948 ... because it had more hotel rooms than the city could support. In 1984 the last hotel rooms were closed and the building was renamed Statler Towers, although three of its public rooms are open to the public for catered events and banquets. After a failed renovation attempt into a combination of hotel and condos in the late 2000s, the building went into bankruptcy, and the vacant building was auctioned in August 2010. On March 15, 2011, the property was acquired by developer Mark D. Croce. Another of the famous Statler hotels was the Hotel Pennsylvania in Manhattan, which was operated by Ellsworth Milton Statler1 after its construction in 1919 and had the Statler name from 1948 until the mid-1980s. After this post was published, a commenter alerted me to the existence of the website Statler City, which documents the history of Hotel Statler and, more importantly, provides updates on the future plans for the historic building. 1. There is conflicting information on where Ellsworth Milton Statler was born. Everyone agrees he was born on October 26, 1863. But some sources list his birthplace as a farm near Gettysburg, Pennsylvania, while other sources list his birthplace as Somerset County, Pennsylvania. Thanks for the comment, Anonymous! 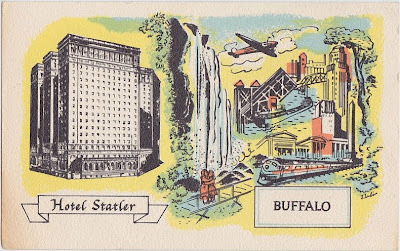 So here's a question: Is the hotel pictured on this postcard the original Hotel Statler in Buffalo, at Swan and Washington streets, which was opened in 1907 and demolished in 1968? Or is it the Statler Towers, which were built in 1923 and is the building that you mention in your comments? Chris, it is the newer 1923 location located at 107 Delaware Avenue. The original hotel location was renamed upon the opening of this new Statler and then later demolished.